Hey guys- it's that time of year again! 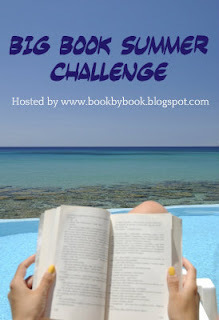 Those of you who've been around for a while will know exactly what I'm talking about- Sue Jackson's Big Book Summer Challenge! Every year, she hosts a challenge which encourages participants to read books over 400 pages. For those of us who're in school, reading large books over the course of the year can be a slow process. Working parents may also share in this struggle. Sue relegates her big reading to the summer- and all participants follow her at least partially. I've participated in this challenge for three years already- and I'm really glad to be joining Sue for my fourth year! You guys should consider joining as well, even if you don't have a blog. You can check out all the details by visiting her blog or Goodreads page. Like I've done in the past, I finished reading some of my Big Books this summer before even writing this post! I like to finish my summer travel and then join, especially when I'm travelling so early in the season. It gives me some time to kick-start my challenge and get me excited before I sign up. This summer, I've only read one big book so far. I had some other books on my TBR list that I just needed to finish before I started the challenge! I began my challenge nice and slow, with a book only 444 pages long. I've read "The Hate U Give" by Angie Thomas-and I loved it! Look forward to a review soon! As some of you may remember from a previous post, I'm currently reading "India After Gandhi" by Ramchandra Guha. It's a long post-independence history of India and hopefully I'll be done by the time school starts. If not, I have time till September 3rd (which is when the challenge ends). While travelling, my mom and I walked into many bookstores and discovered some new books and authors we'd never heard of. Each country likes to highlight their local authors, or books set in their region, so we found a bunch of interesting books. I'm sure some of them are 400+ pages, so you can look forward to some new authors in my review list as well! That's all I think I need to say for this post! Ready... Set... Go! You started with a great one - The Hate U Give was so powerful! The movie adaptation comes out this October! I can't wait. Enjoy your Big Books this summer and remember to stop by the Challenge page to link up any reviews or updates in the 2nd links list. I'm really looking forward to the movie adaptation- it should be great!